·Transmission rate CLASS10 (80MB/S). 1x 32 GB Micro Sd card (with adapter). Compatibility and interoperability. Specifi cation . 1 × 1TB Micro SD Card. Storage Capacity : 1TB. 1 × free Adapter. MPN : Does not apply. EAN : Does not apply. Help & Info. - Play more of your favourite music. Format : MicroSDHC. Description: -100% Brand new and high quality-Expand your devices memory with a 128GB SD card and enjoy more of everything! -Compatible with most mobile phones, PDA's, Tablets and laptops. -Easily expand your devices memory capacity. -Dispatch From UK Fast Delivery. -100% tested one by one before dispatched. -Storage: 128GB Package Included: 1x 128GB SD Card. 1x Free Adapter NOTE: Not compatible with kindles / amazon fire / Nintendo Switch.. Application: Used in mobile phone, Mp3 player, PDA, DVD, electronic book, GPS, car dvr and other vehicle- mounted devices. Description: - Plug-and-play;no external power supply required,USB bus powered. - Share more of your favourite photos and videos with your friends and family. - Capture more photos. - Play more of your favourite music. -Easily expand your devices memory capacity. Expand your devices memory with a 64GB Micro SD card and enjoy more of everything! Compatible with most mobile phones, PDA's, Tablets and laptops etc. 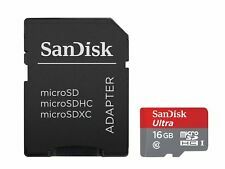 Easily expand your devices memory capacity Description: -100% Brand new and high quality-Expand your devices memory with a 64GB SD card and enjoy more of everything! -Compatible with most mobile phones, PDA's, Tablets and laptops etc. -Easily expand your devices memory capacity. -Fantastic Package to protect this item. -Dispatched From UK Fast Delivery. -100% tested one by one before dispatched. -Storage: 64GB Package Included:. Water proof, temperature proof, x-ray proof, shock proof‡. Storage temperature : -20°C-85°C. Size : About 15 × 11 × 1mm. Model : Performance level. Speed class : CLASS10 U3 V30 A1. Answer - The reading speed will vary depending on the speed of each country's network speed. Descriptions: - Capacity: 32GB - Easily expand your devices memory capacity - Share more of your favourite photos and videos with your friends and family - Capture more photos - Play more of your favourite music - Compatible with most mobile phones,PDA's, Tablets and laptops. - Form factor: microSDHC - Compatibility: Compatible with all microSDHC-supporting host devices - Reliability: Water-proof, temperature-proof, x-ray-proof, vibration-proof, shock-proof Package Included: 1 × SD Card 32GB a Free ADAPTER . Item Description: -Dispatch From UK Fast Delivery. -100% tested one by one before dispatched. -Storage: 128GB -100% Brand new and high quality-Expand your devices memory with a 128GB SD card and enjoy more of everything! -Compatible with most mobile phones, PDA's, Tablets and laptops and dash cams. -Easily expand your devices memory capacity. Package Content: 1 x SD Card 128GB. 1 x Free Adapter Brand Unbranded/Generic MPN Does not apply Format microSDHC Storage Capacity 128GB Pruduct Type TF Card Compatible Brand Universal EAN Does not apply Compatible Brand Universal EAN Does not apply. Ship From UK, FREE Shipping & Fast Delivery! Features: -100% Brand new and high quality-Expand your devices memory with a 64GB SD card and enjoy more of everything! -Compatible with most mobile phones, PDA's, Tablets and laptops, etc. -Easily expand your devices memory capacity. -Dispatch From UK Fast Delivery. -100% tested one by one before dispatched. Package Included: 1x 64GB SD Card. 1x Free Adapter NOTE: Not compatible with kindles / amazon fire..
Descriptions: - Capacity: 64GB - Easily expand your devices memory capacity - Share more of your favourite photos and videos with your friends and family - Capture more photos - Play more of your favourite music - Compatible with most mobile phones,PDA's, Tablets and laptops. - Form factor: microSDHC - Compatibility: Compatible with all microSDHC-supporting host devices - Reliability: Water-proof, temperature-proof, x-ray-proof, vibration-proof, shock-proof Package Included: 1 × SD Card 64GB a Free ADAPTER . The reason you choose us 1.Top quality 2.Fast delivery 3.Competitive price Description: - Capacities: 128GB - micro SDXC card dimensions : 0.43" x 0.59" x 0.039" (11mm x 15mm x 1mm) - No. Feature: mini card with adapter, used in cell phones, tablets, etc. All mini cards are bundled with an adaptor Built-in security features enable users to download, store and play secure content Operating Temperature: -13 to 185F Card Dimensions: 0.8" x 0.8" x 0.05" (L x W x D) Voltage: 2.7V to 3. ·Transmission rate CLASS10(80MB/S). Speed performance level: C10. Features: - Capacity: 128GB - Easily expand your devices memory capacity - Share more of your favourite photos and videos with your friends and family - Capture more photos - Play more of your favourite music - Compatible with most mobile phones,PDA's, Tablets and laptops. - Form factor: microSDHC - Compatibility: Compatible with all microSDHC-supporting host devices - Reliability: Water-proof, temperature-proof, x-ray-proof, vibration-proof, shock-proof Package Included: 1 × Micro SD Card 128GB a Free ADAPTER . Description: -100% Brand new and high quality-Expand your devices memory with a 1TB SD card and enjoy more of everything! -Compatible with most mobile phones, PDA's, Tablets and laptops. -Easily expand your devices memory capacity. -Dispatch From UK Fast Delivery. -100% tested one by one before dispatched. -Storage: 1TB Package Included: 1x 1TB SD Card. 1x Free Adapter NOTE: Not compatible with kindles / amazon fire. Brand Unbranded/Generic MPN Does not apply Format microSDHC Storage Capacity 1TB Pruduct Type TF Card Compatible Brand Universal EAN Does not apply. Details: - Form factor: microSDHC - Capacities:64GB - Compatibility: Compatible with all microSDHC-supporting host devices - Reliability: Water-proof, temperature-proof, x-ray-proof, vibration-proof, shock-proof - Dimension: 24 *32*2.1 mm - Packing: bulk tray/ plastic case/ retail Packing - Use: Compatible with various brands of Mobile phones, Music players, PDAs, etc with SD device. Item Description: -Dispatch From UK Fast Delivery. -100% tested one by one before dispatched. -Storage: 256GB -100% Brand new and high quality-Expand your devices memory with a 256GB SD card and enjoy more of everything! -Compatible with most mobile phones, PDA's, Tablets and laptops and dash cams. -Easily expand your devices memory capacity. Package Content: 1 x SD Card 256GB. 1 x Free Adapter Brand Unbranded/Generic MPN Does not apply Format microSDHC Storage Capacity 256GB Pruduct Type TF Card Compatible Brand Universal EAN Does not apply. Expand your devices memory with a 1TB SD card and enjoy more of everything! Compatible with most mobile phones, PDA's, Tablets and laptops. Easily expand your devices memory capacity Description: -100% Brand new and high quality-Expand your devices memory with a 1TB SD card and enjoy more of everything! -Compatible with most mobile phones, PDA's, Tablets and laptops. -Easily expand your devices memory capacity. -Dispatch From UK Fast Delivery. -100% tested one by one before dispatched. -Storage: 1TB Package Included: 1x 1TB SD Card. 1x Free Adapter . Product Description: -100% Brand new and high quality-Expand your devices memory with a 128GB SD card and enjoy more of everything! -Compatible with most mobile phones, PDA's, Tablets and laptops and dash cams. -Easily expand your devices memory capacity. -Dispatch From UK Fast Delivery. -100% tested one by one before dispatched. -Storage: 128GB Package Included: 1x 128GB SD Card. 1x Free Adapter Please backup all your datas. Brand Unbranded/Generic MPN Does not apply Format microSDHC Storage Capacity 128GB Pruduct Type TF Card Compatible Brand Universal EAN Does not apply. Desription: - Capacities: 512GB - Compatible:with microSDHC & microSDXC host devices - Share more of your favourite photos and videos with your friends and family - Capture more photos - Play more of your favourite music - Easily expand your devices memory capacity - Compatible with most mobile phones, PDA's, Tablets and laptops,not for dash cam,camara and Amazon kindle. Description: -100% Brand new and high quality-Expand your devices memory with a 1TB SD card and enjoy more of everything! -Compatible with most mobile phones, PDA's, Tablets and laptops. -Easily expand your devices memory capacity. -Dispatch From UK Fast Delivery. -100% tested one by one before dispatched. -Storage: 1TB Package Included: 1x 1TB SD Card. 1x Free Adapter Brand Unbranded/Generic MPN Does not apply Format microSDHC Storage Capacity 1TB Manufacturer warranty 1 year Pruduct Type TF Card Compatible Brand Universal EAN Does not apply Memory Card(s) Supported MicroSD. Ship From UK, FREE Shipping & Fast Delivery! Features: -100% Brand new and high quality-Expand your devices memory with a 128GB SD card and enjoy more of everything! -Compatible with most mobile phones, PDA's, Tablets and laptops, etc. -Easily expand your devices memory capacity. -Dispatch From UK Fast Delivery. -100% tested one by one before dispatched. Package Included: 1x 128GB SD Card. 1x Free Adapter NOTE: Not compatible with kindles / amazon fire / camera .. Item Description: -Dispatch From UK Fast Delivery. -100% tested one by one before dispatched. -Storage: 32GB -100% Brand new and high quality-Expand your devices memory with a 32GB SD card and enjoy more of everything! -Compatible with most mobile phones, PDA's, Tablets and laptops and dash cams. -Easily expand your devices memory capacity. Package Content: 1 x SD Card 32GB. 1 x Free Adapter Brand Unbranded/Generic MPN Does not apply Format microSDHC Storage Capacity 32GB Pruduct Type TF Card Compatible Brand Universal EAN Does not apply. Desription: - Capacities:64GB - Compatible:with microSDHC & microSDXC host devices - Share more of your favourite photos and videos with your friends and family - Capture more photos - Play more of your favourite music - Easily expand your devices memory capacity - Compatible with most mobile phones, PDA's, Tablets and laptops. Description: -100% Brand new and high quality-Expand your devices memory with a 64GB SD card and enjoy more of everything! -Compatible with most mobile phones, camera's, PDA's, Tablets and laptops and dash cams. -Easily expand your devices memory capacity. -Dispatch From UK Fast Delivery. -100% tested one by one before dispatched. -Storage: 64GB Package Included: 1x 64GB SD Card. 1x Free Adapter NOTE: Not compatible with kindles / amazon fire / Nintendo Switch..
1 × Micro SD Card 32GB with a Free ADAPTER. 1 × Micro SD Card 32GB with a Free ADAPTER. Storage Capacity : 32GB. For i Phone i Pad Opening Small Screwdriver Set Repair Tool Kit 10 Bit UK. MPN : Does Not Apply. Description: -100% Brand new and high quality-Expand your devices memory with a 32GB SD card and enjoy more of everything! -Compatible with most mobile phones,PDA's, Tablets and laptops. -Easily expand your devices memory capacity. -Dispatch From UK Fast Delivery. -100% tested one by one before dispatched. Package Included: 1x 32GB SD Card. 1x Free Adapter Brand Unbranded/Generic MPN Does not apply Format microSDHC Storage Capacity 32GB Pruduct Type TF Card Compatible Brand Universal EAN Does not apply Memory Card(s) Supported MicroSD. 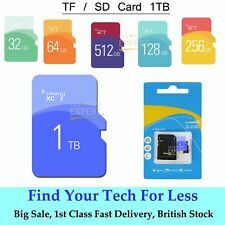 128GB TF Flash Ultra SD Memory Card Storage Disk For Tablets Mobile Phones etc. Features: - Capacities: 128GB - microSDHC/SDXC card dimensions : 0.43" x 0.59" x 0.039" (11mm x 15mm x 1mm) - Compatible:with microSDHC & microSDXC host devices - Share more of your favourite photos with your friends and family - Capture more photos - Play more of your favourite music - Easily expand your devices memory capacity - Compatible with most mobile phones, PDA's, Tablets and laptops and enjoy more of everything! 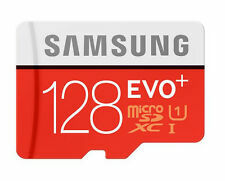 Package Included: 1 × Micro SD Card * 128GB with a Free ADAPTER . Item Description: -Dispatch From UK Fast Delivery. -100% tested one by one before dispatched. -Storage: 1TB -100% Brand new and high quality-Expand your devices memory with a 1TB SD card and enjoy more of everything! -Compatible with most mobile phones, PDA's, Tablets and laptops and dash cams. -Easily expand your devices memory capacity. Package Content: 1 x 1TB SD Card. 1 x Free Adapter Brand Unbranded/Generic MPN Does not apply Format microSDHC Storage Capacity 1TB Pruduct Type TF Card Compatible Brand Universal EAN Does not apply Memory Card(s) Supported MicroSD. Capacity: 32 GB. Adapter size: 24x32x2.1mm. Speed class: C10. Warranty period: one year. 1 × 256GB Micro SD Card. Storage Capacity 256GB. 1 × free Adapter. MPN Does not apply. EAN Does not apply. For OnePlus 3 A3000 A3003 3T A3010 LCD Touch Digitizer Screen Assembly Display. Assembly For Samsung Galaxy S5 i9600 G900F LCD Touch Screen Digitizer Black UK. 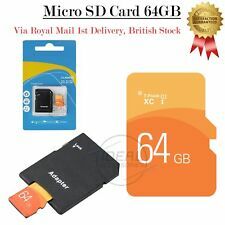 1 × 64GB Micro SD Card. Storage Capacity : 64GB. 1 × free Adapter. MPN : Does not apply. EAN : Does not apply. Help & Info. - Play more of your favourite music. Format : MicroSDHC. Get more speed (up to 30 MB/sec* and enabled Class 6) for faster photo, Full HD† video and app performance on your mobile phone or tablet with SanDisk Mobile Ultra™ microSDHC™ memory cards. The included SD™ adapter lets you quickly transfer files from your PC to your mobile phone or tablet - so you can get the most out of your mobile phone. Do more with SanDisk mobile memory cards.. Description: -100% Brand new and high quality-Expand your devices memory with a 1TB SD card and enjoy more of everything! -Compatible with most mobile phones, PDA's, Tablets and laptops. -Easily expand your devices memory capacity. -Dispatched From UK 1st Fast Delivery. -100% tested one by one before dispatched. -Storage: 1TB Package Included: 1x 1TB SD Card. 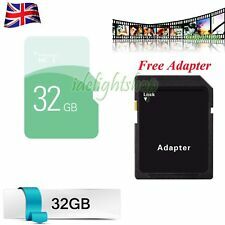 1x Free Adapter NOTE: Not compatible with kindles / amazon fire / Nintendo switch ..
1 × 32GB SD Card. - Capacities: 32GB. Storage Capacity : 32GB. Optimal speed and performance for microSDHC compatible devices - SD adapter is included. 1 × Adapter. - Play more of your favourite music. Details: - Form factor: microSDHC - Capacities:1TB - Compatibility: Compatible with all microSDHC-supporting host devices - Reliability: Water-proof, temperature-proof, x-ray-proof, vibration-proof, shock-proof - Dimension: 24 *32*2.1 mm - Packing: bulk tray/ plastic case/ retail Packing - Use: Compatible with various brands of Mobile phones, Music players, PDAs, etc with SD device. Description: -100% Brand new and high quality-Expand your devices memory with a 1TB SD card and enjoy more of everything! -Compatible with most mobile phones, PDA's, Tablets and laptops and dash cams. -Easily expand your devices memory capacity. -Dispatch From UK Fast Delivery. -100% tested one by one before dispatched. -Storage: 1TB Package Included: 1x 1TB SD Card. 1x Free Adapter Brand Unbranded/Generic MPN Does not apply Format microSDHC Storage Capacity 1TB Pruduct Type TF Card Compatible Brand Universal EAN Does not apply Memory Card(s) Supported MicroSD. Capacity: 16GB. Expand your smartphone or PDA capabilities with more space to get the job done! Will hold thousands of images. hope you could understand. 1 × SD Card 64GB. Storage Capacity : 64GB. 1 × Adapter. - Record more video on the go, even in HD. - Share more of your photos and videos with your friends and family. - Compatibility: Compatible with all microSDHC-supporting host devices. Capacities: 128GB. 1 × 128GB SD Card. Storage Capacity : 128GB. Optimal speed and performance for microSDHC compatible devices - SD adapter is included. 1 × Adapter. - Play more of your favourite music. The following reciters of full Quran are available for you to choose from(max 1) when you place in your order Grab yourself a bargain. Sudais & Shuraym with Urdu Translation. Mishari Al Fassy with Urdu Translation. Details: - Form factor: microSDHC - Compatibility: Compatible with all microSDHC-supporting host devices - Reliability: Water-proof, temperature-proof, x-ray-proof, vibration-proof, shock-proof Desription: - Capacities:256GB - Compatible:with microSDHC & microSDXC host devices - Share more of your favourite photos and videos with your friends and family - Capture more photos - Play more of your favourite music - Easily expand your devices memory capacity - Compatible with most mobile phones, PDA's, Tablets and laptops. Features: - Capacity: 32GB - Easily expand your devices memory capacity - Share more of your favourite photos and videos with your friends and family - Capture more photos - Play more of your favourite music - Compatible with most mobile phones,PDA's, Tablets and laptops. - Form factor: microSDHC - Compatibility: Compatible with all microSDHC-supporting host devices - Reliability: Water-proof, temperature-proof, x-ray-proof, vibration-proof, shock-proof Package Included: 1 × Micro SD Card 32GB a Free ADAPTER .